When I first saw Ms. Cotton Floral up there, I thought her blank expression was amusing. What in the Sam Hill was going on in her head, I thought. 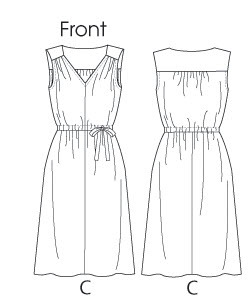 Then I sewed a muslin of that dress (McCall’s 6711) and I understood. Before the shoot for this pattern, Cotton (Ms. Floral if you’re nasty) asked how many yards of fabric were used to make the dress she was modeling. Upon hearing the answer of one million yards, she looked down at the dress in amazement, and then looked into the distance trying to imagine what a bolt with one million yards of fabric would look like. As her brain froze–Cotton isn’t the most imaginative gal in the unicorn kingdom–the camera man whispered, “my Mona Lisa,” and snapped the shot. The moral of the story is when confronted with a pattern illustration (shown below) that, say, represents a graduated A-line dress, and a photo that shows a lady posing in a circus tent, trust the photo. The photo is the truth. The line drawing is a smoke screen with an angry tiger cat waiting in the wings. The pattern illustration wants your blood. Don’t be dinner.